Antique Bisque Dolls – Years ago, the dream of most doll collectors was to be able to afford an antique doll – a doll made from bisque china with glass eyes and a jointed wood or composition body. We used to sigh over pictures in magazines and drool at doll fairs. Then, not so long ago, something happened; prices came tumbling down and doll collectors discovered that their dream really could come true. 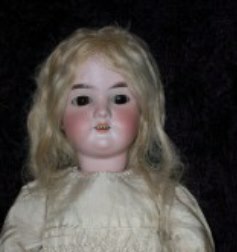 Now is the perfect time to buy antique dolls, before prices begin to rise again – and rise they will, because however lovely reproduction dolls, vinyl babies or modern collectors’ teens might be, they are not old and do not have that special air of mystery which only an antique doll can bestow. Bisque is an unglazed porcelain; it’s matt instead of shiny, hence the ‘biscuit’ finish and so it gives a natural look to the face of a doll. Before the advent of plastics, dolls’ faces would be made from carved wood, composition, papier mache, wax or bisque. Although these substances all had their advantages, bisque was not only the most durable, it also allowed artists to portray the human face in a beautiful way. A doll made completely from bisque would prove expensive, so most had bisque heads attached to bodies and limbs made of composition, leather, wood or fabric stuffed with woodwool. French doll makers made exceptionally beautiful dolls, though they tended to be exceedingly expensive as they were so labour intensive. These dolls, by makers such as Juneau and Bru, were dressed in top quality high fashion garments, and even today most are out of the reach of the average collector. 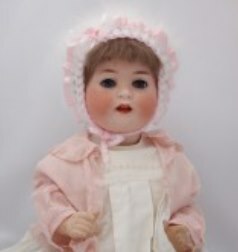 However, German makers also made dolls and soon grew to dominate the industry as they were skilled in mass production. Consequently, they produced dolls in their thousands, far more cheaply than the French factories could manage. The vast majority of old dolls that beginner-collectors are likely to come across will be German, but just because they are cheaper, it doesn’t mean that they are less beautiful. Many German dolls are very pretty indeed, and usually they are incised on the back of the neck with the maker’s name, mark, initials or a number, so from that information and a bit of research you can find the factory and the date the doll was first produced. The most prolific of the German companies was that owned by Armand Marseille, who, despite his French-seeming name, was German. Often it is an Armand Marseille doll that a novice collector will buy as their first old bisque doll, because they are so easily found and can be bought from around £100–£150 depending on condition. One of the most popular and easy to find dolls are the Armand Marseille 390 girls, which have pretty faces and glass eyes. These are usually mounted on a wooden ball-jointed body, which means that you can pose the doll gracefully on display. With these 390s, as with all bisque dolls, it is amazing how dolls from the same mould look so different, due to the handpainting of their faces, which varies the colouring, thickness of lashes and shape of mouth. Also, eye and hair colours/styles influence the doll’s appearance. This is why a 390 is a good doll to start off with – there is so much choice, because these dolls were developed in the early 1900s and remained in production till 1938, and so there are thousands around. Other Armand Marseille moulds to look out for include the character toddler 990, the character girl 327 and the 370 girl. All these dolls should be available in ‘played with’ condition for under £300 – with dolls, obviously price depends on condition, and a much-played with doll with broken fingers and a scant wig will be far less than an almost perfect doll. 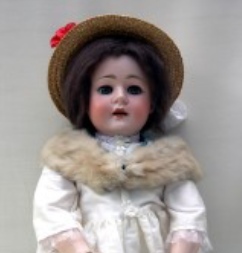 Another Armand Marseille doll which the collector will easily find is the ‘My Dream Baby’. 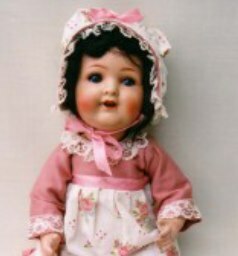 My Dream Baby swept Britain and the Continent during the mid- 1920s, when baby dolls came into vogue, and had a sweet face with either an open or a closed mouth. Today, the closed mouth babies sell for a slightly higher price, as more of the open mouth type were produced, but even so should comfortably fit into the £300 price range. As with the 390 girls, the appearance of these babies varies enormously depending on the painting, the body type, the eye size and the size of the doll (they range from tiny babies just a few inches high to very large babies often used as shop window display models). Of course, there are many other types of affordable German dolls, such as some marked ‘Heubach Koppelsdorf’. Ernst Heubach was a brother-in-law of Armand Marseille, and his company produced very attractive dolls, often with a rather flushed appearance. Other makers of bisque dolls that might be found by collectors include Simon & Halbig, Kestner, Schoenau & Hoffmeister, Kammer & Reinhardt, Alt. Beck & Gottschalk and Schuetzmeister & Quendt. It should be possible to buy the more common models by these makers at a reasonable price, though naturally the rare, more desirable moulds will always fetch a premium. The best advice is to familiarise yourself with the various kinds of dolls and makers by reading books on the subject. Some of these books are in the form of price guides, so will help you discover the models that you can afford. Recently, there has been something of a price slump with some of the antique bisques, so if you find one which appeals, now is the time to buy because prices are bound to rise. Wherever possible, it’s best to buy a doll that you have already seen and handled, rather than one which is advertised on the internet, unless you are confident that the seller can be trusted. Nowadays, many doll shops have closed down, but most ‘Collector’s Centres’ will have a dealer who specialises in antique dolls, or will, at least, have a few dolls which you can see. If there is one which draws your eye, then ask if you can examine it. Check for cracks to the head and for other obvious damage. A good seller will have attached a label to the doll describing its condition and listing any faults. Another excellent place to buy is at a quality doll fair; most of these are regular events, and so the same sellers attend each time. Once you are confident of what to look out for, you might like to attend auctions, too, but it’s important to leave yourself plenty of time to inspect the dolls properly before bidding begins. When you go to a doll fair or shop, you will invariably notice that there is one doll you will be drawn to, and you’ll find you’ll keep going back for another look. That’s the one to ask the seller about – it will probably be the doll which goes home with you! The most important thing of all is to buy an antique bisque doll by which you like – although this may sound obvious, it’s surprising how easy it is to be carried away by the thought of a bargain, only to later realise that you don’t really like the doll’s face. Finally, dolls are personal things. They are all different, so if you love the doll, and the price is right for you, then buy her. Although condition is important, sometimes a hairline crack, dirt, broken fingers and a tatty wig can be overlooked, because the doll has spoken to you. A bisque head can be gently wiped with a damp cloth to remove any grime, but never wash an old doll because water could cause the plaster-based eye-mountings to loosen. It will also dissolve the surface of a composition-bodied doll. Unless you are buying solely for investment, dolls are not bought with the head, but with the heart.